I changed jobs about three months ago, and I don’t think I’ve ever been happier with my working conditions. I’ve got a stupidly large desk in front of a window adjacent to a tree where various native birds have turf wars with crows, presumably for nesting spots, I find the work I’m doing is actually engaging, and my team is full of bright, fun people. Who are obsessed with cake. Whenever anyone asks, it’s a reflex action for me to deny having any particular skill in baking. It’s not that I can’t bake, I just feel that I’m more of a cook than a baker. To me, baking feels like a science, all about precise measurement and timing, whereas cooking involves creativity and a certain amount of flair. I’ve never been very good at following precise instructions. But as you’ll see, I’m getting better at it. I’m fairly sure she was just joking, but always up for a challenge, I decided to call her bluff. Thus I embarked on a two day process that pretty much rivalled the burger cake in terms of difficulty. First of all, the cake wasn’t a single cake at all. It was a tower of four cakes, each of which were made up of two tiers: a shell of dacquoise and a ‘filling’ of a cake with buttermilk and shredded coconut. Then there was the fact that the measurements weren’t so much in cups and tablespoons, but in grams and millilitres; that made me a little anxious. So let’s get to the making of. 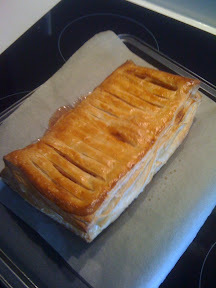 First up was beating the dacquoise, which is basically a meringue with almond meal folded through it. It ends up pretty thick, so to get an even covering of each of the four cake pans, you have to pipe it in. 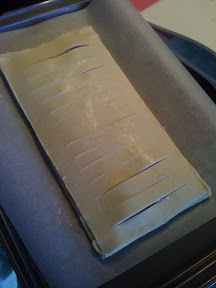 As you’ll see, I got better at this piping thing as I went along. Then came the ‘cradle cake’, which was more meringue, with plain flour, butter, buttermilk, baking powder and shredded coconut. 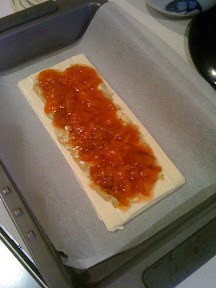 Again, this was piped into the cake tin, and I guess its called the cradle cake because it’s cradled by the dacquoise. They go into the oven for 50 minutes, and then cool in the tins. At this point, I went out to the last roller derby bout of the year, had my face painted, got a little boozy, and then stopped off for laksa on the way home. So by the time I got home, the cakes were well and truly cool. Then the sandwiching began. Cake, whipped cream, sliced mango, more whipped cream, then cake. Repeat. This then gets covered in cling wrap, and sits in the fridge overnight. The next morning, it’s time to make it look pretty. Which is a process of piping – yes, more piping – meringue around the cake stack. Now for some reason, the instructions called for the sugar to be boiled into a hot syrup before it’s added to the egg whites. I’m not sure exactly why that is – I’m sure there will be more experienced bakers out there who know – but my best guess is that it forms a harder crust when you brulee it and then let it cool. Oh yeah, there’s bruleeing involved. Which is awesome, because I’ve been a bit of a pyromaniac since I was a kid. Big thanks to Agnes of Off the Spork for the loan of her blowtorch for this step. I was almost going to use this cake as an excuse to buy one for myself like that time when I organised a margarita night as an excuse to buy a blender, but inexplicably, this time I showed some uncharacteristic restraint. At this point, I started to get a little excited. I thought, “Hey wow! I might actually pull this off!” Of course, there was going to be the issue of transporting the cake to work, and because I didn’t own a cake container large enough to fit the completed cake, I decided to top it once I got into the office. I was a little nervous as I boarded first the train, and then a bus to get to work. Turns out I didn’t really need to worry, because the height of the cake meant it was perfectly wedged in the container, preventing it from moving. First, I topped the cake with what I believe Nigella would call ‘lashings’ of whipped cream, then arranged thin slices of mango on top of that. And some little teensy young mint leaves. Unfortunately, I wasn’t able to find any jasmine flowers, which the recipe called for, so this was my voila! moment. All in all, I think I did pretty well. So here’s what the cake looked like inside. It was an interesting cake; the dacquoise adds a nice chewy texture, and the coconut and mango are a pretty no-brainer flavour combination. The mint and blueberries gave a nice lift to the flavour too, but overall, I still felt the cake was a little too sweet. 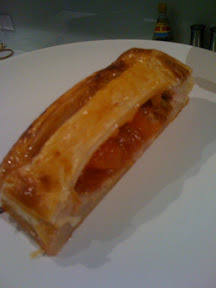 I think perhaps it would have been better if the mangoes had been less ripe, and a little more tart. Also, the cake came out a little dry. I think I’d add more cream if I were ever to attempt this again. So I’m trying my hand at this cookbook challenge again. I think I managed to cook one item last year. Maybe I’ll do two this year? Anyway, the idea behind the challenge is to actually use those cookbooks which we buy, and then promptly never look at, but sit proudly on our bookshelves. A better explanation of the challenge from April. This year, the onus has been lessened, and we’re only required to cook one recipe every fortnight. Phew! Also, Penny has set up a forum over at jeroxie.com for those participating. The first theme: stone fruit. I received a cookbook from my new house-mate for Christmas. He’s quite the baker, and had noticed a gap in my cookbook arsenal (though to be fair, I don’t think he perused the complete Margarret Fulton book – lots of baked goods there! – so he found a baking cookbook which he thought might be suitable. He said something along the lines of “the recipes aren’t too hard, and the chef is a good-looking guy!”. 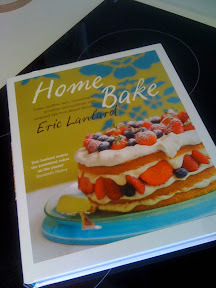 Eric Lanlard even has an endorsement from Liz Hurley on the cover, so he must be the bomb, right? I decided to make the Apricot and Honey Tart, only apricots have been rather lacklustre this season, so I thought I’d just substitute peaches. The interesting and strange thing about this recipe – and I read it three times over to be sure – is that there is NO HONEY in it!?!? I’m thinking that might be some sort of glaring error. 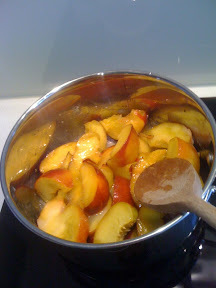 Because seriously, the title says Apricot and Honey. Anyway, I followed the recipe, except for the fruit substitution. The other confusing thing about this recipe is that it calls for a baking sheet, but then the picture is in a rectangular tart tin. Quelle bizarre! Again, I followed the recipe, only the filling was clearly not solid enough, so I built extra walls out of puff pastry to contain it. To be honest, it didn’t taste that great. 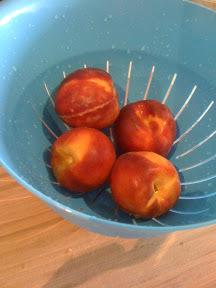 The cream cheese mixture was too cinamon-ny, and although there was a nice punch of peach, it lacked sweetness. Perhaps it needed honey? You know, I’ve never really been an avid follower of recipe magazines. There’s something about working within the constraints of someone else’s taste that seems less fun than experimenting and coming up with your own creations. So even if it’s just by adding a couple of extra ingredients, or substituting one spice for another, I’ll usually end up tweaking a recipe in the process of making the dish. That being said, I find recipes useful, as a point to jump off from. Which is why it doesn’t really bother me whether it’s the Tetsuya cookbook, Gourmet Traveller, or magazines like recipes+ or Woman’s Day where I find my inspiration. Regular readers may know that I’ve recently become the proud owner of a mortgage, so rushing out and spending $50 a pop on cookbooks is much less of an option. So I was intrigued when Magshop said they’d like me to review a food magazine. For those of you who haven’t heard of Magshop, it’s an online magazine shop, where you can subscribe to magazines and have them delivered to you in the mail. It’s cheaper than buying the magazine at the newsagent, and the magazine comes to you, as soon as it’s released. That’s a plus if you’re kind of lazy like me and it’s always good to get mail other than bills, right? It’s also a good gift idea if you forget to buy someone a present; “Um, I got this subscription for you, but you may not get the first one for a week or two.” Yeah, of course I remembered your birthday. 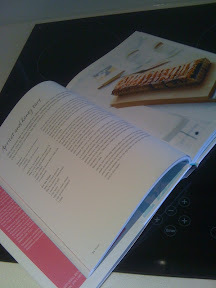 To be honest, I was surprised when my first copy of recipes+ came in the mail. I had expected relatively boring dishes that I would never be interested in, but I guess I underestimated how much the average person knows about food these days. I guess shows like Masterchef really has changed the cooking landscape in Australia. The range of recipes in the magazine was actually pretty interesting, ranging from a pasta with chicken and figs, to chicken biryani, chicken pho (I’m still dubious about that one) and fattoush. And I’ll be honest, when it comes to baking, that’s the one time I will actually follow instructions! Since I had some over-ripe bananas in the fruit bowl, I thought I’d give this pecan banana loaf a shot. The recipe promised I could just beat it in the one bowl, so how hard could it be, right? 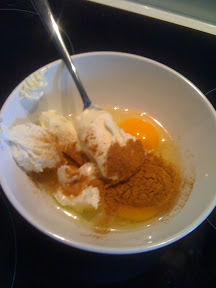 Tip: if you’re mixing a bread/cake batter in a bowl, make sure it’s a big bowl. It also helps if you’re using a proper beater with speed settings, instead of a whisk attachment that came with your stab blender which has only one speed setting: fast. Much splatter and cursing later, I had myself, and in a matter of only minutes, I was pretty much done! I put it in the oven, and kicked back on the couch. Fifty minutes later, and time to see if the recipe was a WIN or a FAIL. It actually came out pretty much perfect! Maybe it rose a little too much in the centre. I’m being picky now. But it was yummy, and wonderfully moist. So the recipes+ banana loaf was a WIN! I didn’t bother with the frosting, because it was already sweet enough for me. Anyway, if the other recipes work this well, I think I might need to get me a subscription. Though to be honest, most of the recipes tend to be for four serves, which doesn’t quite suit my bachelor lifestyle! Unless you’re an avid racing pigeon enthusiast (they don’t stock the Australian Racing Pigeon Journal) you can probably subscribe to your favourite magazine at magshop.com.au. They stock the most popular women’s interest and men’s lifestyle magazines, like the Australian Women’s Weekly, Top Gear, FHM, Money Magazine and Australian Geographic.